You may notice a new page link at the top of this site to Idol DB. That’s where you can explore the database I use to maintain this site. The database holds a record of every performance, every contestant, every song ever sung on American Idol, along with all the statistical variables you could ever want about those things, from Nielsen ratings of shows to performance approval rating, Dialidol numbers, and Votefair popularity. Contestant records show every song that a contestant sang along with biographical info, pre-exposure, and a pic of the person. Each song is linked to a database of songs that contains the Billboard Chart performance of the song, the original artist, how often a song is played on the radio, and more. It isn’t the only Idol Database on the web, but I believe it is the most complete. The database in all its glory. The IdolDB is still under development, with more features being added all the time, but I thought it was better to publish it sooner rather than later. It’s built around IdolAnalytics’ brand new responsive design, and should scale well on mobile and desktop. Click the link and take a look around. Info about Billboard Hot 100 charting of a song came via Bullfrogspond, which maintains a spreadsheet of all Hot 100 charted songs since 1890. I wrote a set of tools which digest this huge file and update a MYSQL database with the information I found most interesting. It will take me a few days in between when that site updates the spreadsheet (every few weeks) and when I have a chance to update the database. Billboard Top 100 year-end lists came from the Billboard site itself, and also from Wikipedia. Billboard began publishing that list in 1958. It includes the most recent (2013) list. 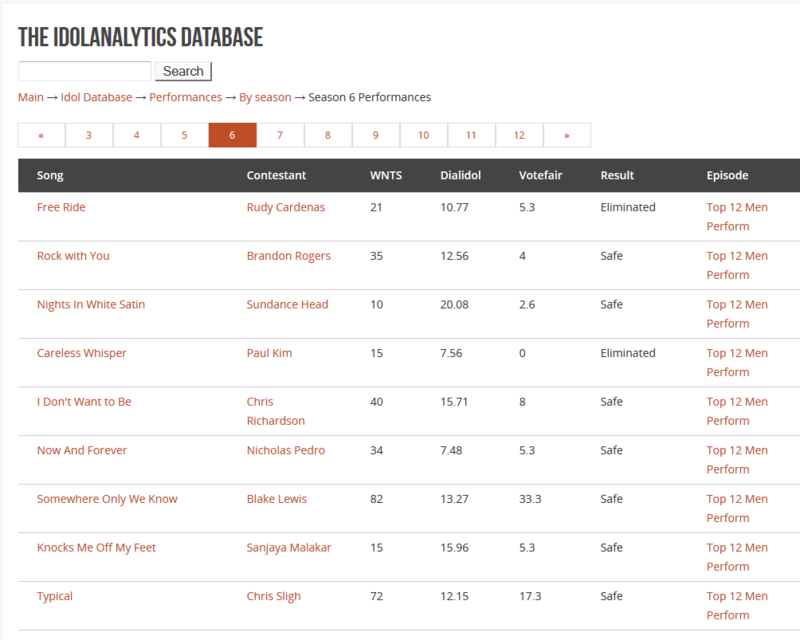 Performance data (song, singer, and episode) was initially mined (several years ago) from WhatNotToSing. Since then I’ve maintained the database independently, reviewed the show footage of every episode and fixed up a few things. Performance variables were collected from WhatNotToSing, Dialidol, and Votefair directly from those sites. Special thanks to Votefair for sending me information that was missing from their site. Biographical information comes from a variety of sources: WhatNotToSing, Idolforums, along with the Twitter and Facebook feeds for the contestants (from which I can sometimes infer their birth dates). Photographs were capped from the episodes by me. Episode information (ratings, viewers) came mostly from Wikipedia and TVByTheNumbers. Pre-exposure was collected and tabulated by me from the original footage. Radio play information was collected in my Statistical Snapshot of American Radio, which is yet to be published (coming soon). Also coming soon: judge’s grades for every performance. I’m currently collecting the data from the original footage, and am about 60% through the process. I have a number of things planned to add to the functionality, such as charts displaying trends for certain things and an artist database. The DB currently has a minimally functioning search engine, but many improvements should be made. Want my data? Don’t scrape! Just send me a request by email (webmaster at idolanalytics.com) along with what information you want, and I will run your query for you. « Opinion: the old semi-final system was great. Idol should go back to it.